Click here to join us on facebook! Just send us a friend request and you can add your favorite fishing adventures to our page! for long.... Start planning for bass as we have some openings . Gar Pike, and Pan fish this is where you need to be. Be sure to call for your reservations!! THAT WILL LEAVE OUR DOCKS WITH ACCOMMODATIONS, SO CHECK OUT CAPTAIN DAVE . 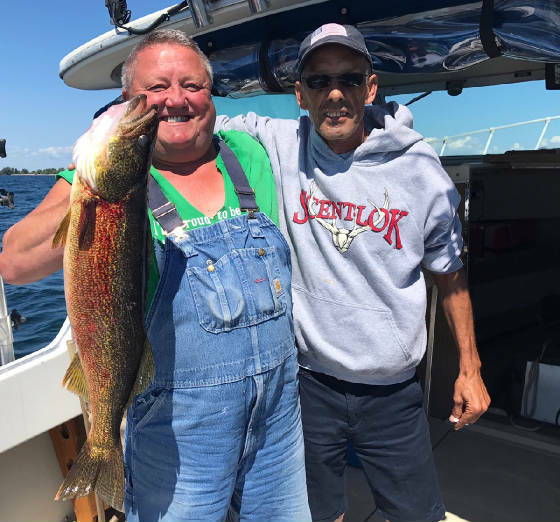 Welcome to Guffin Bay Resort & Marina, LLC Our resort is overlooking the Guffin Bay on Lake Ontario in the Thousand Islands region of New York State,10 minutes away from the Black River, home of the best salmon fishing in New York. We offer: Cottages, Motel, RV sites, Tackle Shop, and Marina with gas sales, boat launch and boat rentals. We have outside winter storage for your RV, boat or jetski for $5.00 per foot. We also offer boat and engine repair as well as installation of equipment (fishfinders, GPS, etc. ).Pets are welcome. We do ask that they are kept on a leash and that you clean up after them. Please let us know at the time you make reservations that you will be bringing along your furry friend. Our season runs from May 1st through October 15th. Directions: Interstate 81 to Watertown exit 46. West on 12F to Brownville. Past the Nice 'n Easy gas station, turn right over the bridge, then left onto 12E. Go 10 miles to Chaumont. There will be a new Nice 'n Easy gas station on the right. You will see a blue sign Guffin Bay Resort and a green sign for Pt. Salubrious, take a hard left, there are two lefts as you turn so take the furthest hard left, follow the Guffin Bay Resort sign with arrow, onto Co. Rt. 125. Go 2.4 miles. You'll see our tackle shop and ice machine on left, motel and cottages on right. Our address is 9474 Co. Rt. 125.
and get all the current weather patterns. We accept MASTERCARD, DISCOVER, and VISA credit cards, personal checks, and cash.